2018 Buffoon of the Year Selection Show! A Week of BAD Decisions! When Andre Walker is not acting as Lobby Correspondent at Townhall.com covering the work of the British Parliament and Prime Minister, he's sounding off about politics and pop culture across the pond as part of Behind Enemy Lines! A political staffer for 15 years before becoming a journalist, Andre Walker brings a unique ... See More perspective to American politics mixed with a singular sarcastic wit. You can follow him on Twitter @andrejpwalker and catch him weekly Behind Enemy Lines! 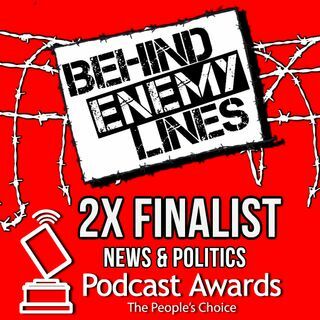 Behind Enemy Lines is a national Award-Winning radio show / podcast broadcasting live out of the belly of the Democratic beast - "The People's Republic of" New York that airs on WJHC 107.5 FM (Jasper, FL), WDDQ 92.1 FM (Adel, GA) and WLBB 1330 AM (Carrollton, GA) as part of the Talk America Radio Network, as well as across ... See More premium networks streaming across the internet. The show highlights national politics with a conservative spin from "insurgent" Republicans fighting for every scrap they can get! Guests from the world of politics - candidates, elected officials, journalists, authors, personalities, pundits and prognosticators - stop by to discuss current events. The show and its predecessor, Brooklyn GOP Radio, has been recognized as a legitimate source - even shows like The O'Reilly Factor and CBS This Morning have cited the show and its blog for original source material! But it's not all business on air - in fact, there's rarely a dull moment. Sarcasm is a second language on Behind Enemy Lines, as evidenced by the wildly successful "Buffoon of the Week", where the hosts will nominate a public figure and hold him/her out for ridicule for some dubious distinction ripped from the headlines, culminating at the end of the year with "Buffoon of the Year" honors bestowed upon the truly deserving. We're surrounded. And taking heavy fire. But we stand and say "Bring. It. On." We're Behind Enemy Lines.